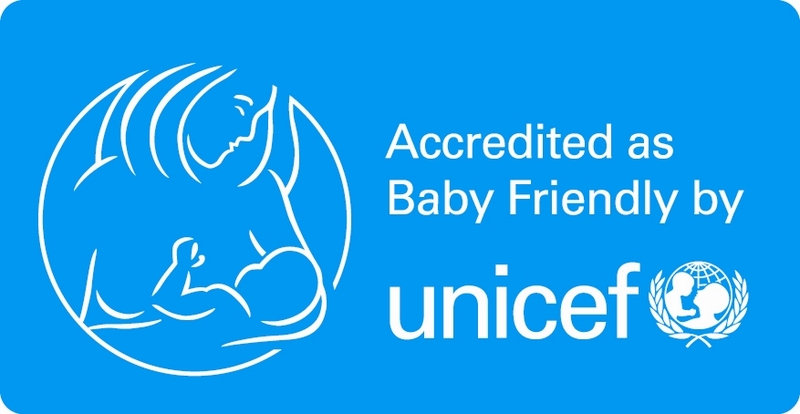 Our maternity services have been accredited by UNICEF as Baby Friendly since 2002 and it is very important to us to support women and their families in their baby feeding choices, and in building a close and loving relationship with their baby. Do not leave your baby to cry. All midwives, maternity support workers, maternity infant feeding assistants and neonatal nurses receive training in infant feeding. This training is updated regularly to ensure the advice and support we offer you is up to date, consistent and appropriate. Our obstetric and paediatric doctors also have the opportunity for regular training (obstetric doctors specialise in pregnancy and childbirth and paediatricians specialise in babies and children). When your baby is born hold him against your skin as soon as possible and for as long as you want. Skin-to-skin contact is a lovely way to say hello. Some mothers do not decide how to feed their baby until after birth. When your baby is born, skin-to-skin contact and holding your baby can make you feel differently, so it is a good idea to keep an open mind. As baby relaxes he will begin to search around for your breast making tiny mouthing and head bobbing movements. If you decide to breastfeed let your baby take his time to seek out and find your breast as he is learning exactly what to do to get that valuable first feed. You may decide to only give your baby one breastfeed but this still has many benefits for your baby. If you choose to bottle feed this is a good time to give that special first feed while still in skin-to-skin contact with your baby. It is also recommended that dads and birth partners have skin-to-skin contact with their baby.